My eldest son when about sixteen years of age being anxious to hunt a bear in the holes in the month of January we set out for the Big Gap of Meadow Mountain where we seldom failed to have good luck. We reached the rocks early in the day; but before we got to the bear holes we found in the deep snow what we took to be the tracks of a wolf, which had apparently just passed along before us. We slipped the dogs and soon hearing them barking at a great rate we ran up to them; when to our surprise instead of a wolf we found a panther upon a tree. I took a fair shot at him, and killed him without any fight. We then went to the holes when the dogs soon found a large bear in one of them. They ran in, commenced the attack, and fought desperately until we showed up. We pulled one dog out and held him, though the other would not budge, but kept up the fight a long time until my boy saw part of the bear through a crack in the rock. I saw it also; and firing at a venture I gave him a severe wound which made him mad and out he came full drive. As he was leaving the hole I sent a bullet through him, which decided the battle in our favor and the bear was ours. As we went home I remembered a hole on the route which we agreed to visit. 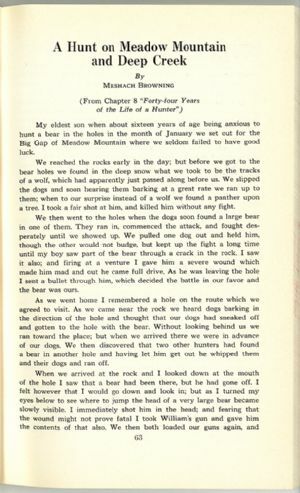 As we came near the rock we heard dogs barking in the direction of the hole and thought that our dogs had sneaked off and gotten to the hole with the bear. Without looking behind us we ran toward the place; but when we arrived there we were in advance of our dogs. We then discovered that two other hunters had found a bear in another hole and having let him get out he whipped them and their dogs and ran off.